Travel down Las Vegas' famed Chapel Row and learn about an industry that hosts close to 90,000 weddings a year! Hear insider information about this huge piece of tourism and why people flock to Sin City to get married. You will be picked up and escorted to the various stops by limousine as if you were the guest attending the wedding. Learn why Las Vegas has become known as the 'Wedding Capital of the World' on this private tour. Your tour will start with hotel pickup by limousine from your Las Vegas Strip hotel where your driver will take you down Chapel Row. As you sit back, your guide will point out landmark chapels such as the world famous Little White Chapel, where celebrities like Frank Sinatra and Mia Farrow, Britney Spears, Joan Collins, Michael Jordan and many more were married. Stop at an Elvis themed chapel that has been featured on shows such as Extra, The Sharon Osborne Show and The View to name a few. A light snack will be provided in this unique venue. You'll continue to see the many different chapels that make up the Wedding District before see the Drive Thru Wedding Chapel -- only in Vegas can you find this! 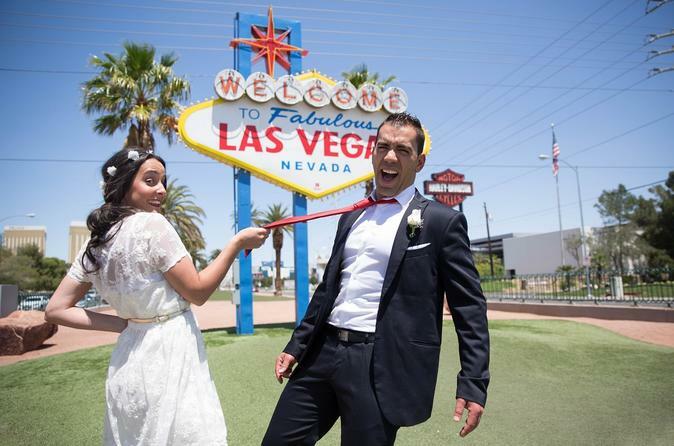 Before returning to your hotel, you'll enjoy a stop at the "Welcome to Las Vegas Sign" which was added to the National Register of Historic places and weddings are performed here daily. You can capture great photos along the way and will leave with a souvenir document telling you about all the celebrities married in Las Vegas. Please note: the price displayed is valid for up to six (6) passengers.